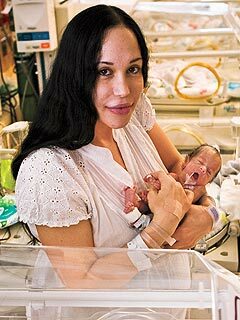 Last week we reported that Nadya Suleman had turned down an offer for 24-hour care for the infants and six older children to lapse after she was told that a reality show and a biweekly press conference on the babies’ condition was out of the question due to their fragile immune systems. According to Dr. Phil McGraw, who help arranged the deal along with attorney Gloria Allred, Nadya has accepted the invitation of Angels in Waiting, to provide around-the-clock care once the babies are brought home over the next few weeks. “Nadya realized that she had to make every effort to care for the octuplets as well as the six children at home in a way that proved that she understood the enormity and complexity of the task ahead,” says McGraw. The neonatal intensive care nurses specialize in premature infant developmental care, says Linda Conforti West, CEO and founder of Angels in Waiting. The agency would have 14 nurses a day, four to five at a time, working around the clock, representatives recently told People. Normally, they say, that kind of care would cost about $135,000 a month. The nurses’ salaries are paid by the organization. In addition to the assistance she will receive for caring for the babies, she has also purchased a 4 bedroom home that is “a good house for kids,” says realtor Mike Patel. The house is 2500 square feet and has a large backyard. Nadya Suleman Shops With Her Gang!